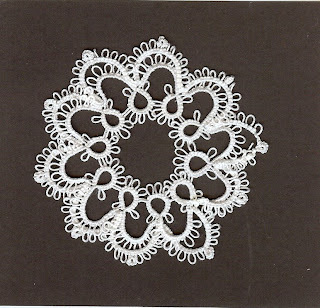 Here it is the first snowflake in the DMC Tatting for Today booklet that I have. There are 31 motif's in this booklet. I believe that some are way beyond my capabilities. But some of them I am willing to try. This is actually the second one from the booklet that I have done. I did make a mistake on this one but it doesn't affect the snowflake. I left off one of the center rings by mistake but unless you have the pattern I guess you would never know. I have another snowflake from DMC Festive Tatting all done by finishing off the ends. When I have them finished I will upload a picture of that one. This booklet has 22 snowflakes to try. I still need to make a bookmark for Christmas and the thread arrived that I want to use just yesterday. I have found a pattern that I like so maybe I had better work on that before I tackle another snowflake. We are currently under a weather advisory and expecting up to 8 additional inches of snow. I won't be going anywhere with that on the way. So I guess I can spend the time tatting snowflakes for my windows. Nice! It is fun to see all the snowflakes falling this time of year! LOL!